The circle is a omnipresent, universal symbol with extensive meaning. Without beginning or end, without sides or corners this geometric shape tells about perfection, unity, spirituality and life like no other form. As Pythagoras would say, the circle is the most perfect shape, it withholds all and everything emerges out of it. Every point of the circumference is the exact same distance from the center. The circle has no beginning and no end, it is infinite and stands for non-existence and eternity. The circle is, to a certain extent, the oldest of all symbols. Easier to illustrate is only a point – an that is basically a circle as well; a very small, filled one, but nevertheless a circle. Taking a closer look at point and circle we already reach the core meaning of the circle’s symbolism: The circle is the outer expression, the construction; and the point is the absolute key aspect of the symbol, the core which everything turns around. The point is like the ruling sun in astrology, it is the base from which everything exists or not. Everyone who has drawn a circle knows that this center point must exist for it’s construction. This middle point stands for centralized power, the base or heart of all energy. In a transferal sense it is God, the cosmic consciousness and enlightenment. The symbol of the circle, in a general sense, stands for oneness, wholeness, unity, entity, perfection, infinity, life without beginning or end, balance and the cosmos. In a simple way the circle shows us the complete story of creation. In the beginning there was nothing, and then there became consciousness. The consciousness is symbolized through the creation of the circumference within nothingness. We, as a part of this oneness, (consciousness) search in many different ways to find the center of this circle again. We move towards the center in concentrated circles until we bring our own reality to a point, this circulation forms a circle. Enlightenment, is the bringing together of God (the point), and the cosmic consciousness (the circle). This is basically the symbolism underlying all circular forms and constructions, including the sphere, as its three dimensional representation, egg and spiral. All other complex signs based on circles are amplifications and variations of this ancient, prototypical symbol. Many spiritual and energetic symbols from all different cultures are based on circular constructions. Often they’re seen also as protective symbols. In occult practices, standing within a circle shields people from supernatural dangers or outside influences. The rules of the cosmic and atomic structure of many natural phenomena are based on the circular form. This alone is a good enough reason to understand the power of the symbol of the circle. I recognize a universal ground principle in this: circles within circles, in circles, endlessly – everything connected with, and within each other. An infinite mesh of concentrated vibrations. Every thought, every form of energy, moves or concentrates in circular or spherical courses. Heat rays are spherically formed, planets circle the sun, atoms circle their center nucleus, our thoughts circle our problems, circular waves radiate in water from an object touching it’s surface, etc. etc. Our life seems to flow in a circle. We enter the world through a circular opening, we grow up in a family circle. We see the world through a circular opening (pupils) embedded in the circular iris, which in itself is a beautiful, circular cosmos of its own. We take our course through life and our soul leaves our mortal being through a round hole in the fontanel for the wheel of reincarnation, according to eastern religions, … and so we experience small and large aspects of our lives taking the form of a circle. As mentioned before, the list of circular symbols and symbols that are based on circles is endless and would definitely go beyond the scope of this article. The following examples are chosen randomly from my catalogue. Ensō is Japanese and means circle. The word is also used for mandalas and sacred, circular spaces. The sign comes from Japanese calligraphy – although it is a Symbol not a character! It is closely connected with Zen Buddhism. In this teaching, the ensō stands for enlightenment, perfection, strength, elegance, the universe and the void. For more information about this multifaceted symbol please refer to the article explaining my ensō+ series. 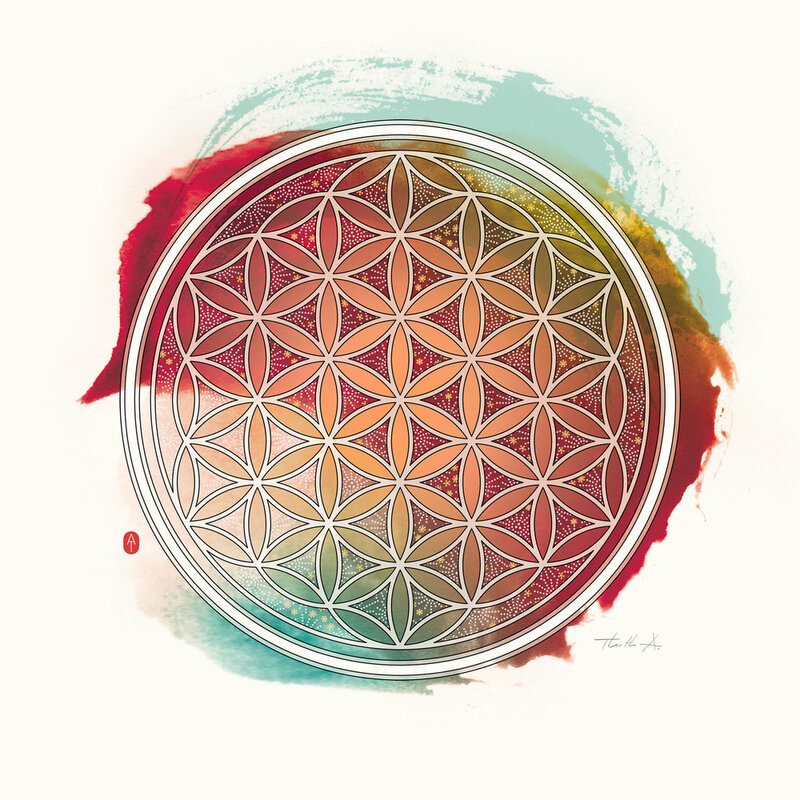 The flower of life is extremely popular and attributed with a strong, healing and harmonizing effect. In many cultures around the world the flower of life is known as a symbol of energy and can be found in temples and initiation sites. The oldest representation known is decorating the columns of the temple complex Osireion in Abydos, Egypt, and is about 5000 years old. In a Tibetan monastery another ancient flower of life was found with an estimated age of 2000 years. The renaissance of the flower of life began in the early 1990s, when Drunvalo Melchizedek studied the Egyptian mysteries and published his knowledge, describing the flower of life as the basic structure of the sacred geometry and a fundamental form of existence and creation. As such it eliminates blockages and establishes an unimpeded flow of energy. The flower is considered to function as a portal to the Akashic records, a universal energy field in which all existing knowledge and events are stored. Through meditation over this symbol one can receive answers to specific questions or get in contact with any recorded knowledge. The nautilus (ναυτίλος) is probably one of the most beautiful sea creatures we know. Its shell is regarded as the most perfect, logarithmic spiral occurring in nature. Like spirals in general, the nautilus embodies development, dynamics and the cosmic energy. The construction of the shell is extremely stable and can withstand enormous pressure. For that the nautilus is also a symbol of resistance, strength and good planning. Sometimes the nautilus is referred to as living fossil because it already lived long before the dinosaurs! Its original form is found in the ammonite fossils. In addition to perfection and beauty, it therefore symbolizes also endurance and origin. The construction of the shell is a true masterpiece. This housing is divided into an actual living chamber and a section with several, gas-filled chambers. Each chamber in the Interior of the shell follows exactly the Fibonacci sequence, the resulting golden spiral plays an important role in sacred geometry representing the golden ratio 1.6180339... One doesn’t have to be a mathematician to recognize the poetic beauty of the nautilus. It is archaic and forward-looking at the same time, multi-layered and versatile. Note: Sometimes the symbolic interpretation of the spiral changes by its rotation direction: the clockwise spiral is regarded as a sign of becoming (creation), developing from the central point to the outside. The left hand spiral stands for the passing away (the return to unity), returning from the outside to the middle. There is also a “doubled” version of the spiral (Fermat’s spiral), representing both movements at the same time. In this sense, the spiral can also stand for the inner conversion of people, for spiritual transformation and renewal. 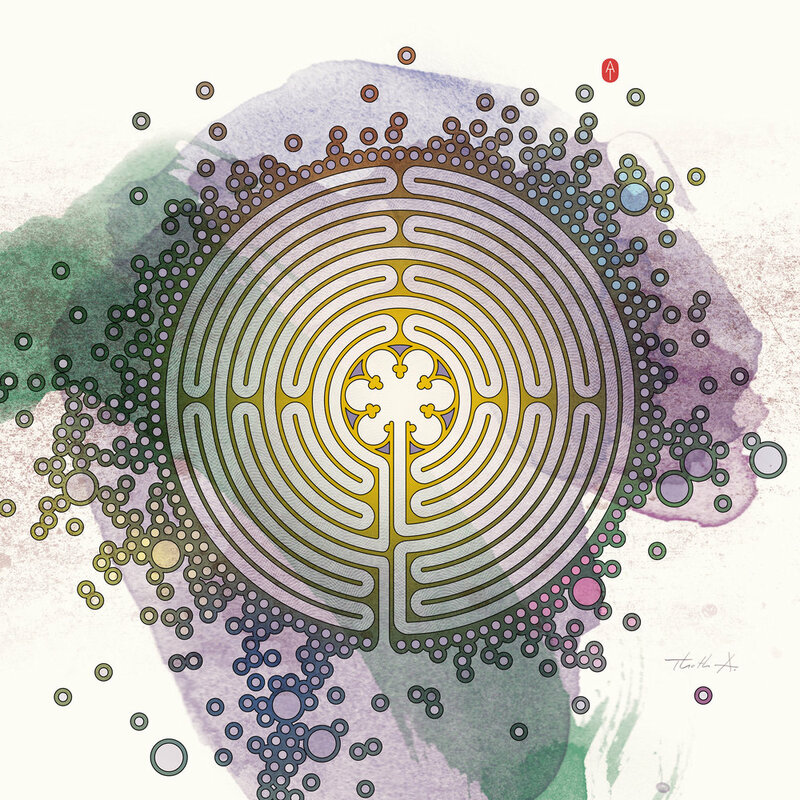 A labyrinth describes a system of intertwined lines or paths which, through numerous changes of direction, form a mysterious pattern inevitably leading to a centered goal. The construction stands for our path through life and man’s striving towards unity and oneness. The labyrinth also embodies our spiritual and psychic journeys in search of knowledge and our innermost being. One of the most famous labyrinth is located in the cathedral of Chartre, in fact it is a mosaic embedded in the stone floor of the nave. Of course one knows also the famous labyrinths from Greek and Roman legends. However, labyrinths were known at any time and in any culture. Sometimes labyrinths were also built to hide and protect graves or treasure chambers. Out of this idea the labyrinth was later developed as a protective amulet against evil spirits. Labyrinths have always fascinated man. Instinctively, everyone tries to find the ‘right way’. Accordingly, the symbol is still very popular and various in its visual representation. However, round, geometric and symmetrical constructions are the most common. Its symbolism is kind of complement to the themes of the circle and similar to the spiral. The term mandala is Sanskrit and translates with circle. Basically it describes a circular image possessing a magical or religious meaning, used in cult practice of Hinduism, Buddhism, indigenous traditions, Islam and other cultures around the world. The visual can be geometric only or crafted with figural motifs, but always oriented to a center point. Nowadays, the word mandala is used as a generic term to describe all kinds of meditative, circle oriented images of various cultures and origins, which can include also a wide variety of religious, esoteric, psychological and spiritual symbols. Mandalas are visual tools (with representation of gods, landscapes, symbols and other aids) to internalize complex, religious contexts. In this sense, the mandala can be understood as a kind of diagram, whereby different religious traditions are using various different ‘blueprints’, some of them are very differentiated and used for specific rituals and practices. The symbolism of a mandala aims directly towards the unconscious, so that targeted areas of the psyche can be addressed and stimulated by specific colors and shapes. This characteristic is used by a wide range of meditation techniques and by therapeutic practices as well. The goal of a mandala meditation is usually the experience of unity. Fu, Lu, Shou – Luck To Go! Attract The Energy Of Wealth!